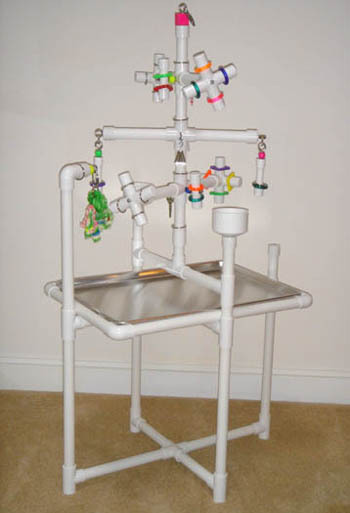 The Medium "Kitchen Sink" Conversion PlayGym was specifically designed for medium-sized birds such as African Greys, Amazons, Eclectus, smaller Macaws and Cockatoos and other similar-sized birds in mind. The gym is made with a 1" PVC base, appropriately sized perches, PVC food cups, removable aluminum tray and PVC toys and spinners to keep a large bird entertained. The perches are adapted for safety and security ... they are scored for your bird's comfort with our texturing process that simulates the feeling and confidence natural wood provides. The perch-scoring process does not create grooves that can harbor bacteria that is almost impossible to remove. This playgym can be easily cleaned. There is nothing on this playgym that can unscrewed or removed by your birds. All toys are included and are reloadable and interchangeable, and made of PV. All the heavy-duty plastic accessories add interest and appeal for your birds. Create 2 activity centers in less than a minute by removing the top "Kitchen Sink" portion of the playgym and replace it with the T-Perch that is included. The T-Perch includes toy hangers so your bird will continue to have a welcome play environment on the stand. See photo below with T-Perch in place. T-Perch to Replace "Kitchen Sink"